“Character Code Value” (Ctrl+I) does not work for Emoji and CJK ext. B, C, D, E & F characters. Thank you for your feedback. 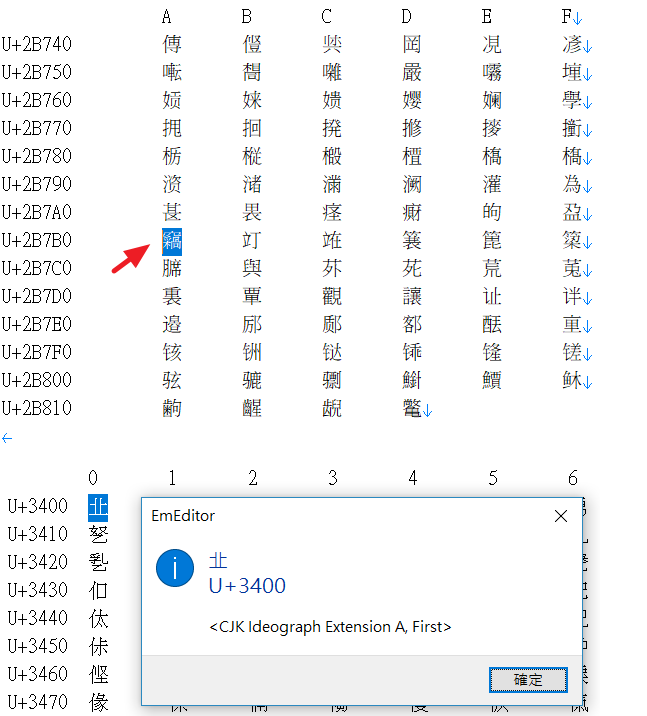 The Character Code Value window was intended to show the Unicode block name if character name was not found. The next beta version will correctly display the block name. Just feedback that “Character Code Value” still have problem on beta 2. It seems EE v17.5.901 & v17.5.902 can not work for U+xxxxx (Five digits). On beta 2, emed64_17.5.902_portable, I am seeing the correct output for various three byte CJK characters. I tested on UTF-16 and UTF-8. Could you show me a screenshot of what you are seeing? Tested on Win7 64bit & Win10 64bit; EmEditor v17.5.902 64bit & 32bit portable, all default setting. Step 2. View -> Character Code Value or Press Ctrl+I, nothing happened. The problem is the step 1, in EE v17.5.902, it can not select the ext. B~F Characters first, just put the cursor before the character is ok. But in EE v17.5.0 or earlier, have no this limitations, it can select the ext. B~F Characters first, and then press Ctrl+I. Thank you sky. I have fixed this for the next build.